Unique hotels you can stay at around the world. Do you want to spice up your vacation by staying in a unique or theme-style hotel? 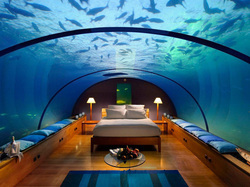 Check out these fun accommodations. Some are serious, some are concepts for the future, and some are just outright crazy (in a good way for ThemeTrippers). Always check with their company before booking to make sure they are still in business. If you are owned by a high-maintenance cat, live in the UK, or are visiting, check the Ings Luxury Cat Hotel. This luxury, felines-only hotel pampers your cat while you are away. Pampered would be an understatement. Your adorable kitty will be served from an A La Carte Menu in fine bone china and will sleep in chic goose-feather down beds! The luxurious suites alone made me envious as I wrote this. I am guessing your favorite pampered kitty will not be missing home anytime soon if they are lucky enough to be staying here. Beckham Creek Cave Lodge, located in Ozark Mountains of Parthenon, AR, is a perfect collaboration between mother nature and man. This destination hotel was built as a 5600 sq. ft. private home at a price of 6 million in 1989 and has since been renovated in 2007. The charm of this cave-dwelling home lies in its authenticity. The dripping of the natural stalactites, the hues of the cave walls, the waterfall, and the tunnels. Don't let the rocks fool you, this is a true luxury rental. Enjoy your quiet time with a jacuzzi, steel appliances in a full kitchen, flat panel television, a game room, Wi-Fi, and a CD sound system with the cave acoustics to make it sound like your own private concert hall. Oh, and don't forget to bring your fishing poles, the large pond is stocked for catch and release. Mcmenamins Kennedy School, Portland, Oregon. What was once a place where elementary students gathered to learn arithmetic, has now been converted into a unique theme hotel. With multiple on-site bars and even a brewery, you can have a drink in class and not get suspended. Enjoy a cigar in the detention room, well sure! With 57 guest rooms, some themed just the way we like them, (a former classrooms with original chalk boards and an authors' theme room) you can explore their old auditorium which is a current movie theater, walk the halls to view the extensive original art and historic photographs, or visit the converted cafeteria which is now the Courtyard restaurant. They also have a heated soaking pool. This fun hotel would also make a great reunion destination with your oldest and dearest friends. The Shady Dell Vintage Trailer Court, Bisbee, Arizona. Feeling a bit nostalgic? Well, head back in time and listen to some 50's music, play vintage games, and sip your martini in one of nine fully and lovingly restored Airstreams. 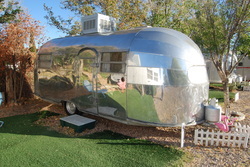 America's love affair with the Airstream started in 1932 and still has a dedicated following. The Shady Dell's Vintage Trailer Court deserves a following as well with their combination of American kitsch and the comforts of home. You might choose the 1949 Airstream that was pictured in Bride’s Magazine in 1949 or how about the 1947 Tiki Bus complete with its own hand-carved outrigger bar? Which ever model you choose, you will surely find one that fits your personality. Did you know that Hugh Hefner even bought Pamela Anderson an Airstream with a "workout" pole? Yep, they named that white beauty the "Lovestream". Now, these fun models don't have "exercise" poles, but the 1951 Royal Mansion has leopard carpet, so that is the one I would choose. Situated in Paradise Island, Bahamas is the Atlantis Resort. Many of the luxuries have been shroud in mystery about the famed Royal Bridge suite that spans the arch (supposedly where Oprah has stayed among other celebrities). The room is said to be so luxurious it actually takes your body temp and adjusts the room to fit your perfect body temperature. 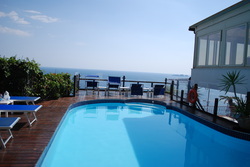 For everyone else, the resort has hotel rooms as well as one and two bedroom suites. The good news is everyone that stays at the Atlantis can use their 41-acre water park, eleven unique pools, and five of the softest sand beaches. We had the opportunity to snorkel with the giant rays here in their private pool and it was a priceless experience. Make sure you get reservations in advance if you want to have amazing ray experience. Nightly Earthship rentals provides unique, fully furnished pod homes to experience completely sustainable, yet surprisingly modern amenities. For an off-grid vacation, try your survival plan by staying in either one or three bedroom pods. Eden Roc Hotel. Located in Positano, Italy. This ultra-romantic hotel set in the Almafi Coast, overlooks the Mediterranean sea and the Spiaggia Grande Beach. Perched on a high cliff, the spacious rooms boast luxuries such as multi-light showers and private patios (with personal Jacuzzis on them), making this a must go to destination. You will never forget the beautiful panoramic view from their rooftop pool, your private patio, as well as their intimate patio restaurant . The also say in the winter the town takes on an appearance of a nativity scene. Eden Roc's luxuries, friendly staff, and well.... location have earned a spot as my favorite romantic place. A one-of-a-kind hotel experience. 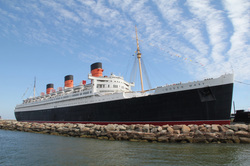 The Queen Mary, once the grandest ocean liners in the world, is now a Long Beach hotel. *"Tea room for tea with Diana; Legacy of a princess"
Balleyseede Castle in Kerry, Ireland, dates back to the 1590's. With thirty acres of native woodlands and one of the most beautifully formal gardens, this "hotel" is truly unique. 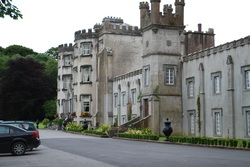 We were lucky to have stayed here in 2009 and it felt like we had stepped back in time as we enjoyed tea with scones in the casual dining room, and a fabulous culinary dinner in the formal. The best part was Mr. Higgins the Irish Wolfhound and his sidekick Einstein peeking around the corners to watch us as we explored the castle. Hotel De glace: Ice hotel 10 minutes from Quebec City. Don't wait to get your reservations, this hotel disappears each spring! Open Jan 5-March 24th so you can live the ultimate Nordic adventure. future date. This amazing concept has had many possible opening dates starting in 2006. This is a true dream vacation since it is currently only a dream.